Today, people enjoy more material wealth and comforts, yet we tend to feel more impoverished emotionally and psychologically. 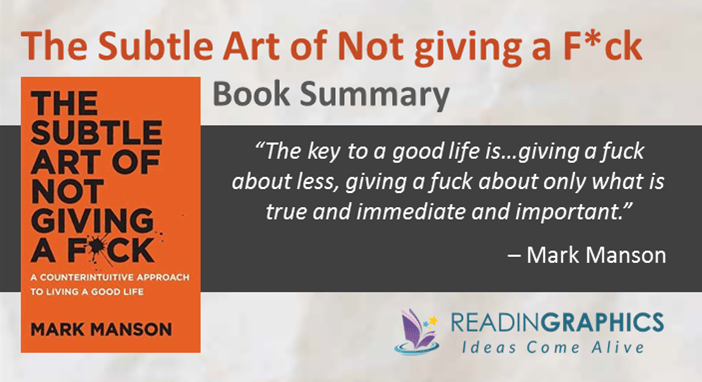 In “The Subtle Art of Not Giving a F*ck”, Mark Manson offers insights and tips to help us cope with our pain, failures and regrets, so we can live life fully and find genuine happiness. Manson delivers the ideas in his unique style, using irreverent and extremely “colorful” language to drive his points home. In this summary, we’ll outline the key ideas in 2 parts: debunking modern myths on success and happiness, and embracing the 5 counterintuitive values for a good life. We are constantly bombarded by messages about becoming happier, healthier, smarter and richer. We buy more things and experiences, hoping to improve our image, happiness level and satisfaction. Yet, in the pursuit of more, we end up losing sight of what we already have, and reinforce our sense of lack. Many of our modern values—like success, positivity, greatness, and freedom—can actually make us more insecure and miserable. The way to be happy and fulfilled, Manson says, is to not give a f*ck about everything we’re told to care about. Instead, get clear on what truly matters, focus your choices on those few priorities, and accept that in spite of that, you’ll still make stupid mistakes and suffer occasionally. Here’s an overview of some of the success myths you should ditch. Do get a copy of our full 13-page summary for more details on each of these myths, or get the full mojo from the book. Here’s the paradox: the more you pursue the positives, the more negative you’ll feel. Those who desperately want to be rich, worthy or happy will only end up feeling poorer, more unworthy or unhappy. On the other hand, the more you accept the negatives in your life, the better you’ll feel. In fact, most we’re surrounded by so many messages about being positive that we tend to feel bad for feeling bad. Manson calls this the “feedback loop from hell”. The way to stop the loop is to stop giving a f*ck about everything or trying to be perfect. It’s perfectly normal to feel upset or unmotivated at times. Stop giving a f*ck about conventional norms and others’ opinions (come on, be different!). Stop giving a f*ck about pain and adversity (after all, you can’t win without overcoming challenges). Instead, decide what you truly give a f*ck about, and focus on that above all else. Pain (both physical and physiological) is a part of our biological feedback system to tell us something needs our attention and action. You can’t avoid pain, and trying to do so will only bring more pain. In fact, happiness doesn’t come from being problem-free; it comes from solving meaningful problems. Rather than focusing only on the outcomes you’d enjoy, ask yourself: What pain and struggles might you enjoy and sustain? For example, will you enjoy the pain of training for a triathlon, or the uncertainties of entrepreneurship? By identifying what you’re willing to endure, you can fall in love not just with the reward but also the process. In the book / full summary, we explain why every solution will generate more problems, and how you can use your pain and emotions as signposts to move forward in life. Do you believe that you’re special and destined for greatness? The bad news is, you’re not special–you’re average. And most of those amazing stories you see/hear on the mass media are the extremes, not the norm. Having unrealistic expectations of what’s “normal” is dangerous: it’ll only make you feel insecure/inadequate or give you a false sense of entitlement to success. The good news is, you can still achieve extraordinary results. The key is to accept that you’re average, that others face similar challenges as you do, and the bulk of the work you do will be mundane and inconsequential. Only then can you focus on doing what’s really needed to improve yourself and overcome your flaws and problems. Since suffering is inevitable, the question we should be asking isn’t how we can end our suffering, but for what purpose are we suffering. 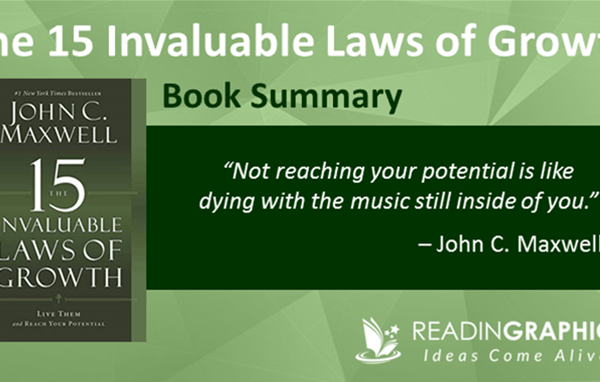 In the book / complete 13-page summary, we’ll explain (a) the 3 layers of self-awareness, (b) how these levels of self-awareness affect your life and (c) how your values (both good and bad) can define how you live and see life. In a nutshell, your values determine how you define success and failure, how you judge/measure yourself and others, and thus what you do and don’t do. Mark Manson’s core message in this book is this: to have a good life, you should only give a f*ck about the right values (which define your priorities). Don’t give a damn about anything else. 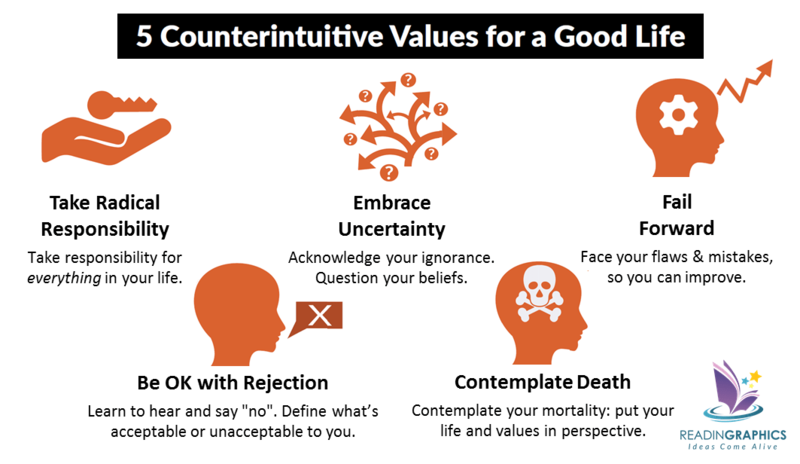 To improve your life, these are the 5 unconventional values you must embrace. We’ll now briefly introduce the 5 values. 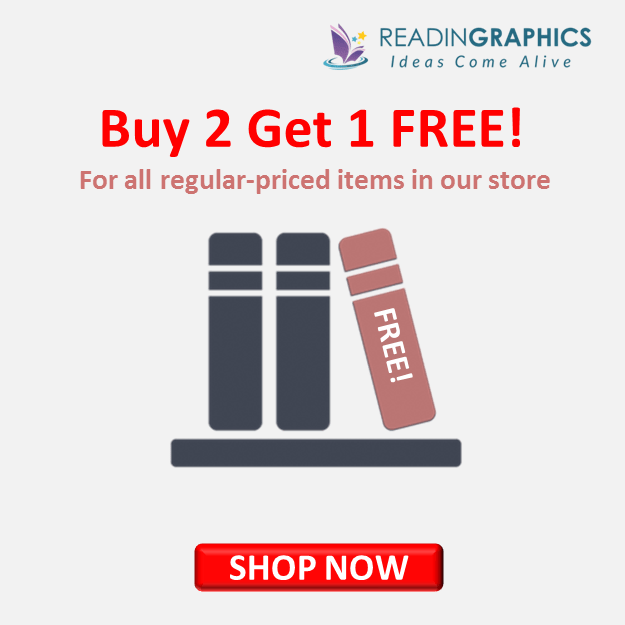 Do get our full summary bundle or read the book for more details. No matter what happens in your life, you can always choose how to react. Thus, you always have full control over the outcomes in your life, even if life deals you a bad hand (e.g. being born with deficiencies, or losing a loved one). 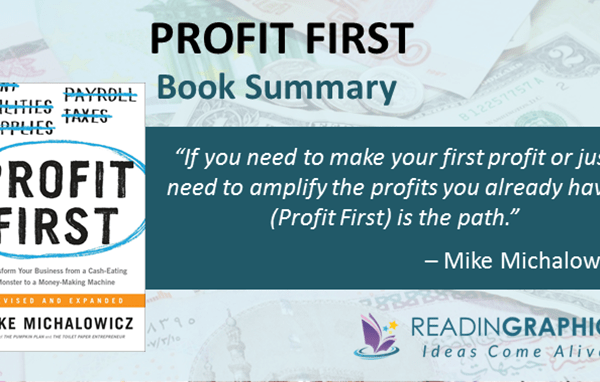 In the book / full summary, we explain why you gain power over your problems when you take responsibility for them, why you’re always choosing (even when you think you have no choice), why you shouldn’t confuse responsibility with fault, and how to make the shift toward radical responsibility. The only way to grow is to realize that your perspectives, knowledge, and even your values/beliefs aren’t absolute—they can always change or be proven wrong. Read the book / complete summary to find out why you can’t trust “universal truths” nor your own brain, why your perspective is so flawed and biased, why absolute certainty is so dangerous, and how you can open yourself up to alternative viewpoints and possibilities. Earlier, we touched on why your values determine how you approach life. In the book, Manson explains why you should go for process-oriented values, and how to handle pain and fear to keep moving forward. (b) To build healthy relationships, both parties must be able to say “no”, thrash out their differences, establish their boundaries and take ownership for their own problems: only then can true understanding trust and acceptance be established. In the our 13-page summary, we elaborate why/how commitment can give you freedom and how to build/mend trust in your relationships. Thinking deeply about death helps us to put our adversities in context and to appreciate life. If you fear death (or are preoccupied with ensuring that people remember you after you’re gone), you won’t be able to live fully. However, if you’ve confronted your mortality, can accept your life as a passing grain in the timelessness of the universe, and can focus on contributing to a wider cause that will outlive you, then you’ll find true peace and happiness, and become free to live each day to the fullest. Manson’s irreverent and colorful writing style offers a refreshing way to explore ideas on spiritual enlightenment, inner peace and happiness. 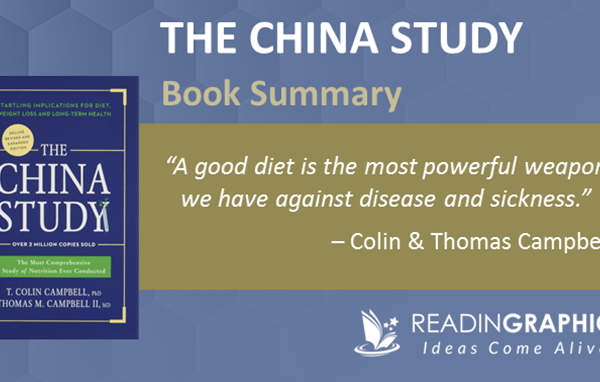 The book includes many examples from his personal experiences and famous personalities, as well as some references to relevant empirical research. 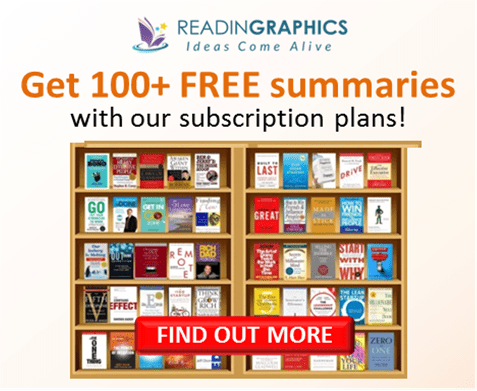 Do get a copy of the book for the full details, get our full summary bundle for a detailed overview of the various ideas and tips, or visit markmanson.net for more resources. Learn the true secret to peace, happiness and living a fulfilling life! 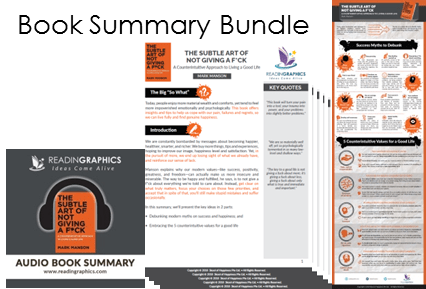 Click here to download The Subtle Art of Not Giving a F*ck summary & infographic Click here to order the book online Click here for more resources and free tips!